Tonight is the Blue Moon. 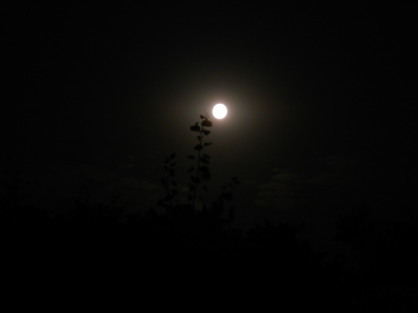 Did you know that a Blue Moon is when a full moon happens twice in one month? We had a full moon on August 2 and one tonight. 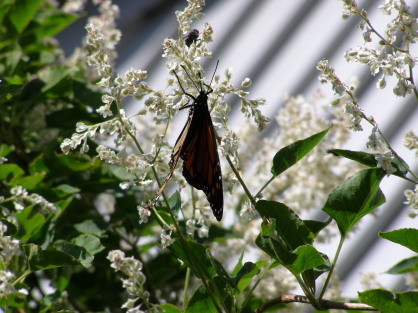 It took a tripod and a lot of patience to get this one good photo! I've been busy finishing! Yes, finishing! Four wallhangings and a table runner. Started knitting a cowl for my mom--yes, colder weather is coming. Knitting can take longer than it seems like it should. Or at least it does for me. So I need to start now if I have any hope of keeping someone warm when needed. That's all the news that's fit to print at the moment. Check out the website for updates to my schedule and in some other categories as well. P.S. I am listening to Angel Falls by Kristin Hannah. Normally, when cutting quarter square triangles, one cuts a square and divides it diagonally twice. The math (eek!) is easy. Simply add 1.25 inches to the desired finished size square. For example, add 1.25 + 6 inches (finished square) = 7.25 inches. You would cut a square 7.25 inches and divide twice diagonally to yield four quarter square triangles. Quarter square triangles have straight of the grain on the outer (longest) side, with two bias edges. Half-square triangles, on the other hand, have two straight of grain sides and one bias. They are NOT interchangeable. Using these triangles correctly adds stability to your blocks and settings. Easy enough. But what happens when you don't have enough fabric to cut a full square? 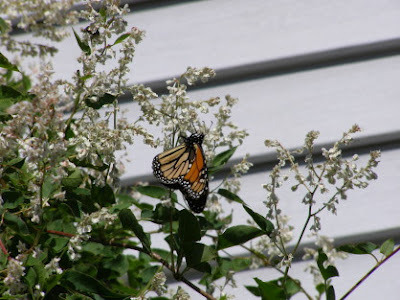 What if you are working with scraps? I had a group of fabrics that I had cut all the squares I could but still lacked a bunch of triangles to finish the project in the size I wanted. So I took one of the quarter square triangles I had cut from a square and laid my ruler on it, matching the short sides to the edges of my ruler. I placed some of the green painters tape on the wrong side of the ruler as shown here. Now I have an exact mark to cut quarter square triangles with. The tape acts as a bumper to place along the straight edge of the fabric. 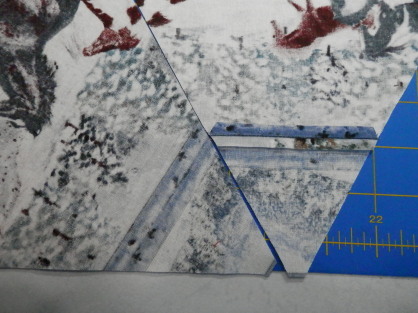 Here is a scrap of fabric, the ruler aligned with the tape against the straight (cross or lengthwise) grain. I can cut the two straight sides for a perfect quarter square triangle in the size I need! If I had had more fabric or wanted a great many triangles of this fabric, I could have cut a strip the width of the triangle and alternated the template to cut with no waste. 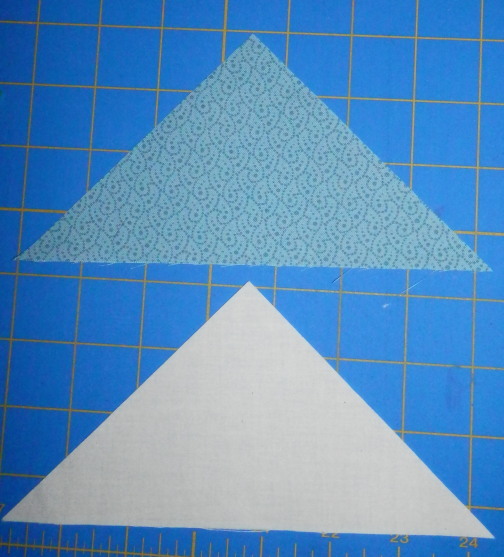 The muslin triangle is cut from a square; the blue one from the scrap. Exactly the same size! And I was able to finish the project as planned. 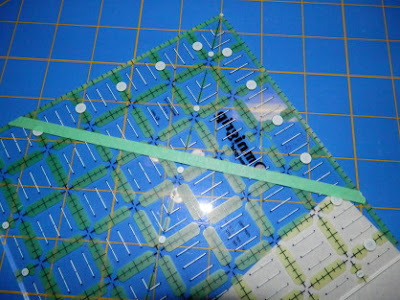 Now, you're asking, what happens if you are cutting all scraps and don't even have enough for one full square in the right size? Simple! 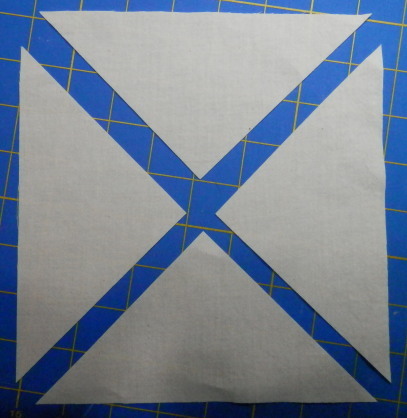 Cut a square of paper the correct size, divide it twice diagonally and carry on as shown above! Other than the addition of 1.25 inches to the finished size of the block, there is no other math with this method! So there you have it--another tutorial. Simple but effective. Necessity is the mother of invention. 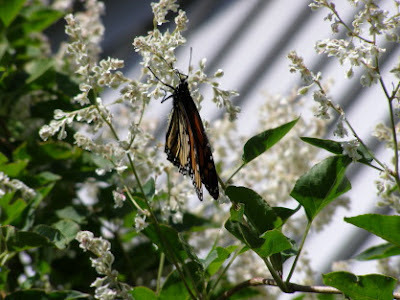 Tonight is on "making-do" and the next post will be a Necessity tutorial of a different nature. While at a quilt shop, I found this beautiful horse fabric. It was a one yard cut and I wasn't sure what I would do with it--but I loved it and bought it. Before leaving the store, I remembered the pattern for "Easy Striped Table Runner" by The Quilt Company (www.thequiltcompany.com). The shop had it, I bought it and away I went. Here's the fabric. I definitely wanted some of those mountains in the center. 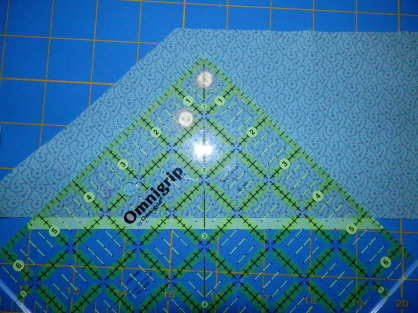 I cut the long strips for the two sides and started cutting the 60 degree triangles from the leftover part. Oops, I was going to be one triangle short. I had laid the runner out on the floor (where Lynnie promptly twirled on it) and knew it was going to be really pretty. So, knowing the shop had no more of this fabric, I went on a search. Called all the LQSs--no luck. I did find some on-line and was one click away from ordering. But something came up and off I went. 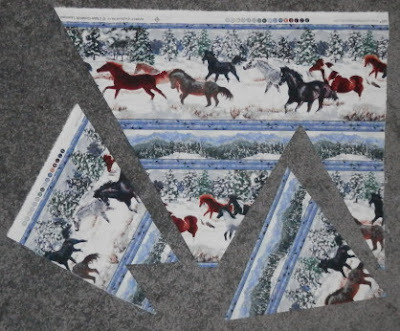 When I came back to the fabric, I was gobsmacked...why not piece together the last triangle? I had enough fabric to do that! Bet you didn't guess which one was pieced, did you? Here's a clue--from the back. From the front you would have to actually feel for the extra fabric underneath the seam to know it is there. 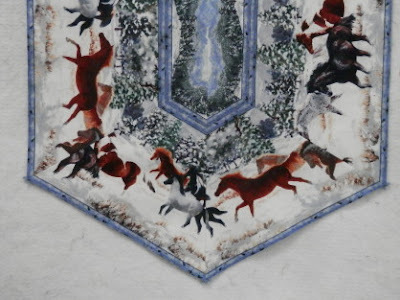 Here's a detail with the triangle that was pieced together. No break in design. 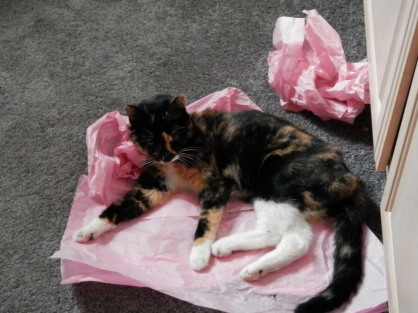 And this is all the fabric I had left over. If you buy what the pattern calls for in yardage, this is a wonderfully easy, striking runner to make. So do what I say, not what I did! 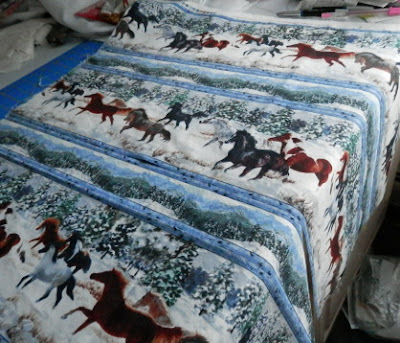 The Jinny Beyer border stripes would be fabulous in this runner. Give it a look-see--I will make this again--but with more fabric to start with! That's it for tonight. Are you all remembering how special you are? Pay that forward tomorrow--tell someone else how special they are. Let's start Monday off on a happy note! While you are ALL winners, this is a special award that comes with a ribbon and everything! 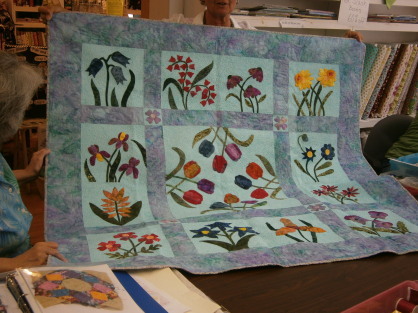 Doreen from Auburn, New York, won a first place ribbon for her flower garden quilt at the New York State Fair!!!!! This was Doreen's first official applique project. Her friend Ruth asked her to come to class with her and didn't tell her that it was a 13-month class! 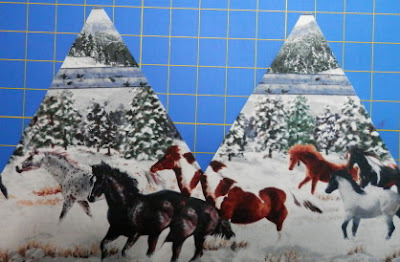 Doreen's work is spectacular and I am including the pictures from a previous post to help you remember the quilt. 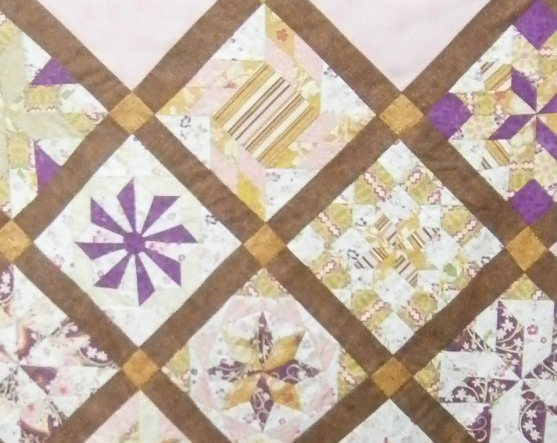 Fabulous machine quilting by her daughter Mandy. 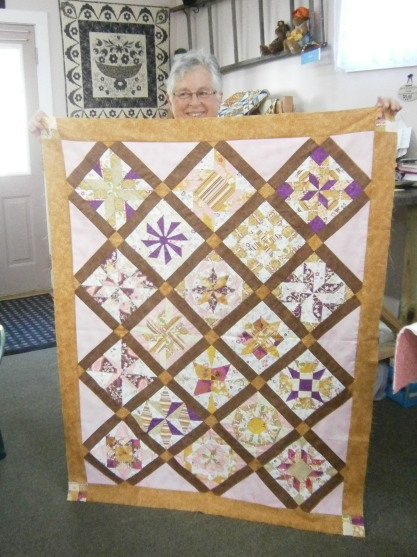 And she gave the quilt to her mom! Congratulations, Doreen! Well deserved! Be sure to look for this winner if you are at the State Fair. It'll be worth the trip! 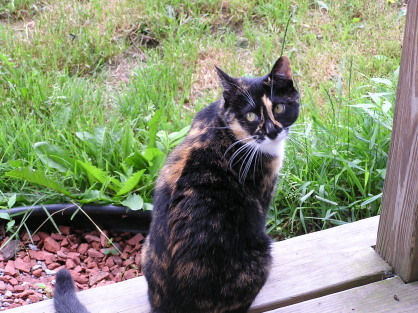 On a personal note, many thanks to all who posted comments about Callie. For such a small cat, she certainly had a lot of "presence". Those 14 years went by in a flash. She was dropped in November of 1998 and we adopted her. She was always tiny which I guess made me think she was always young. In her heart she was. Thanks again. P.S. I am listening to Night Vision by Randy Wayne White, a new-to-me author. I like his style. So long, my friend. 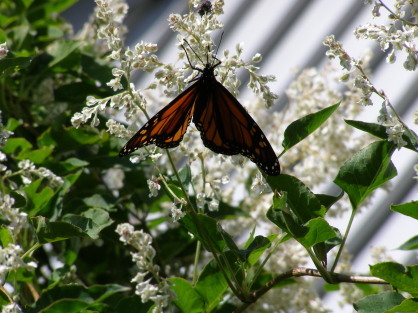 I miss you terribly--the house is so quiet without you. This has been such an exciting year for student finishes! 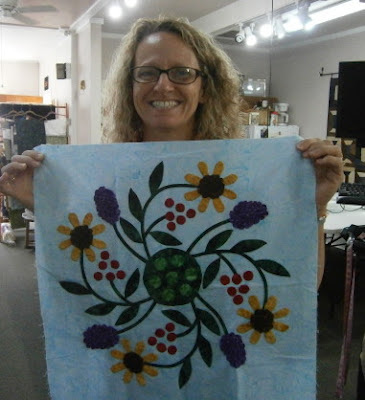 Here's Lorraine W. with her Dancing Flowers block completed. She is one happy appliquer! And that's real needleturn applique--not that "finger-press-me-under-stitch-me-down" stuff! You rock, Lorraine! And Marie finished her Monthly Bliss 1 top! And a detail. The fabrics are much prettier in person, but you can see what a wide range of textures she used. She hand pieced the blocks and set them by machine. Beautiful job, Marie! Wow! They do me proud! Coming up? A short tutorial on.... Stay tuned! Not much news here. 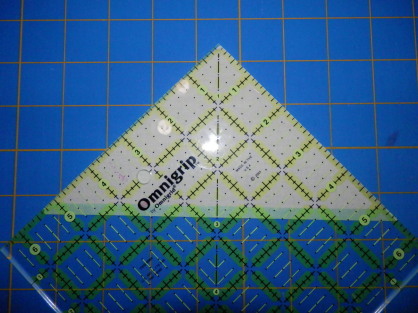 I've been busy all weekend working on Mariner's Compasses with hand piecing. My warped sense of humor is very apparent on one. I'll share when it's a bit farther along. Here are some pictures for your enjoyment. P.S. I am listening to Persuader by Lee Child.